I follow, and am frequently impressed, by the Renewables International blog. Today I am not impressed. Ontario's grid operator IESO believes total wind and solar capacity will increase by 3.2 GW over the next 18 months. By August 2014, solar and wind power will reach a total installed capacity of 6.8 GW, roughly a fifth of the province's total power generation capacity. 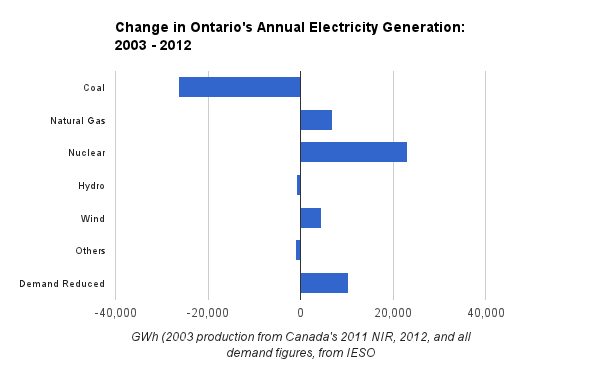 By that point, Ontario will have reduced its coal power down to nearly zero. Ontario is to have coal reduced to nearly zero by the end of 2013 - and the IESO shows only another 254MW of wind capacity by that time. Whatever the other 3GW of wind and solar is for, it is not for replacing coal. I politely corrected one of the writers of this new article on a statement made regarding Ontario replacing coal with wind in a January article; "Can renewables replace coal?" My comment attached to that article was not disputed by Pembina's Tim Weis in a later comment, although Weis's interpretation of nuclear's performance remained detached from facts. Weis claimed that "Nuclear supply has remained relatively constant since the coal phase out officially began in 2003." I pulled production figures for production in 2003 from page 50 of Part 3 of Canada's 1990-2009 National Inventory Report and 2012 figures as reported by the system operator. Coal is down 26.3TWh while nuclear is up 23.2TWh, demand down 10.4 and natural gas-fired generation up 7 TWh (Ontario has moved from importing to exporting heavily). Those claiming wind has been particularly relevant in replacing coal are delusional or dishonest. By the spring of 2014, the South Kent Energy wind farm should have 124 turbines from Siemens connected to the grid..... The project is a part of a new campaign by Samsung and Pattern Energy, which aim to invest a total of seven billion US dollars in 2.5 gigawatts of new wind and solar in Ontario. The initial deal with the Korean consortium (usually only referenced as Samsung now), announced over 3 years ago spouted the $7 billion figure, and avoided noting the contracts for the output equaled roughly $20 billion. Three years later we now know, from an article in the Toronto Star, that if that $7 billion is ever spent, most of it will simply be taken from the payments received on a much, much smaller actual investment risk taken by Samsung. Kim says the total investment so far is about $300 million, with 380 jobs created. That’s a far cry from $7 billion and 900 jobs. But Kim says once the generating projects get built, the investment total will rise rapidly. The statement on investment following project construction is made clearer by some recent news on the financing of the South Kent wind farm - the one noted in the German blog. The financing deal was originally cited as being Pattern Energy's, probably because not only is the Korean Consortium not using their own money, they also seem to have outsourced sourcing - and project development -.to U.S. heavyweight Pattern. Pattern has a template for getting financing for building 250+ MW capacity wind projects that will use Siemens turbines; they recently put together a similar deal for a project in Ocotillo, California. The Korean Consortium has an agreement worth $20 billion, in revenue, to them- they look content to risk all of $300 million of their own money to realize that contract. and wound up here "Misinformation about Ontario's Electricity Sector pushes into the German blogosphere". your community pages like your Facebook page, twitter feed, or linkedin profile? Hey there, You've performed a fantastic job. I will definitely digg it and in my view suggest to my friends. I am sure they will be benefited from this website. done with it's well worth every hectic time. Thank you for this post. Loved it! to you to abide. The tolerant of "branch of knowledge"? or activity for a object to go bet on to school. Cheap Jordan induce price to jewellery.